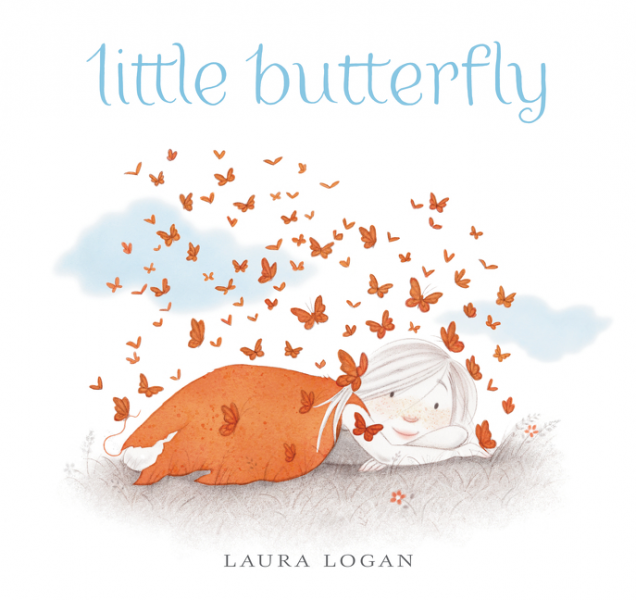 little butterfly by Laura Logan is a little bit of magic. While monarch butterflies, their migratory path and their recent comeback are infinitely fascinating, Logan's book is not about this aspect of these lovely creatures. In the author's note at the end of the book, Logan does touch on the journey of the butterflies, adding this quote from Aesop, "No act of kindness, no matter how small, is ever wasted," to give depth to experience of the main character in this wordless picture book. Instead, Logan and her main character, a little girl with a torn cape and an injured butterfly, have an imaginary migration of their own. This beautiful illustration can be found under the dust jacket! The palette for little butterfly is limited to oranges, greys and browns and the occasional dash of sky blue and the trim size is small, adding to the delight of the book. Arriving home from school and getting off the bus, the girl's cape snags and tears. As the bus pulls away, the girl abandons her backpack and runs across a field. A cat watches her and a monarch butterfly enters the scene. Sitting in the grass with her cat, the butterfly flutters near and is injured by the playful cat. Protected by the girl, the butterfly is able to take off again and the girl and her cat curl up under her cape and fall asleep. As the girl sleeps, a flutter of butterflies sweeps over her and carries her away. Over land an sea, past a flock of geese and into a forest where thousands and thousands of butterflies are resting, like the many here in California, including this one in Pismo Beach. The journey ends with the girl's cape becoming a pair of monarch wings before she is returned to the field where her journey began. The images in little butterfly can be mixed and not always adhering to the logic of the story, but as a wordless picture book, you can make whatever you want of them. It's better to just let the illustrations carry you along on the journey.